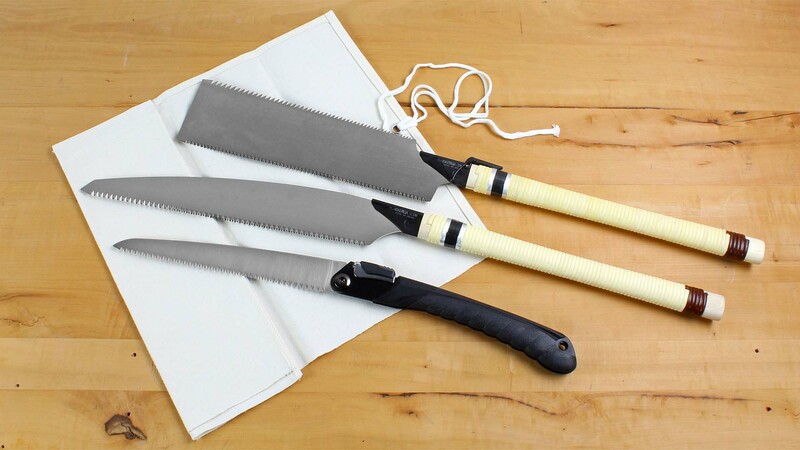 Saw sets are a good introduction to using Japanese saws and help the more experienced user to advance to higher skill levels. 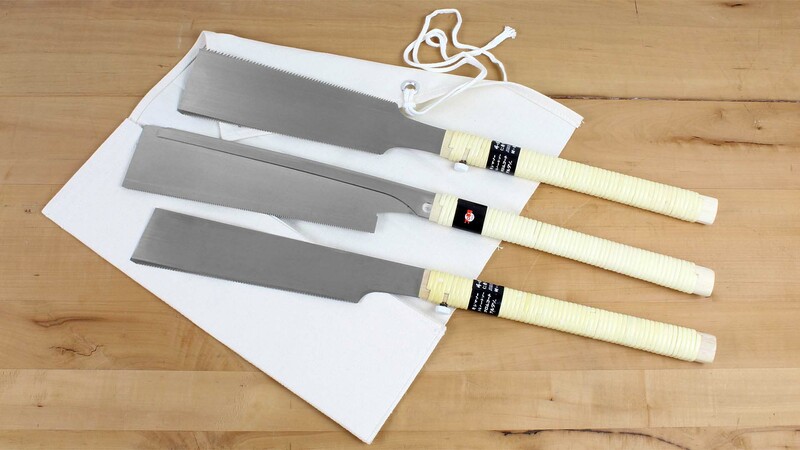 If you haven't used Japanese saws before, start with the least expensive set; you'll still get professional-looking results. Once you're familiar with these saws, you will see your work improve to the point where you will want to try higher-grade tools. I am convinced there is such a thing as aesthetics in work processes. Using professional-grade saws based on the centuries-old art of tool-making will give you the opportunity to experience this. If you are prepared to respect and properly care for saws of a quality and precision that may exceed your present skill level, there is no reason not to use them. But you will appreciate that we cannot accept kinked saw blades and broken teeth as material defects. Saw blades kink, break or even tear when they are not properly guided. Teeth break when too much pressure is applied, especially in hardwood, or if you hit a hidden nail, or jerk or twist the saw. The finer the saw, the more care you need to take when using it. 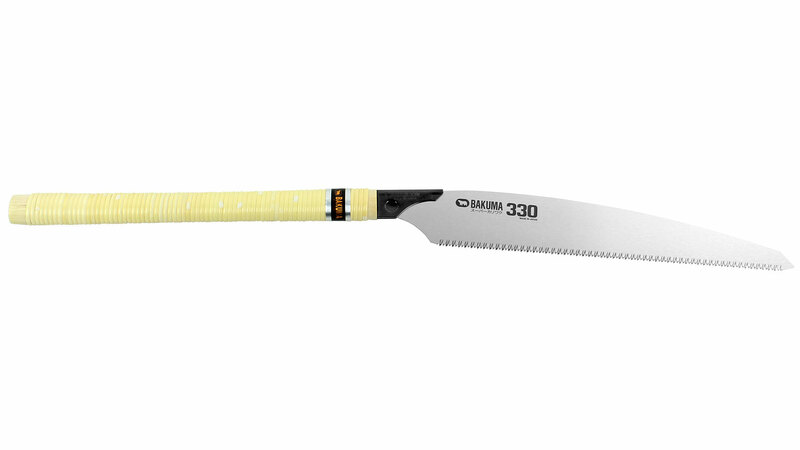 This saw set consists of a Ryoba Lifesaw with a 250 mm blade (313780) and a Dozuki "KITSUTSUKI" with a 240 mm blade for cuts with and across the grain (309327) plus an undyed canvas pouch for three saws (309858). This is also the ideal set for vocational training, because as a rule the two saws will be adequate for any required cut. 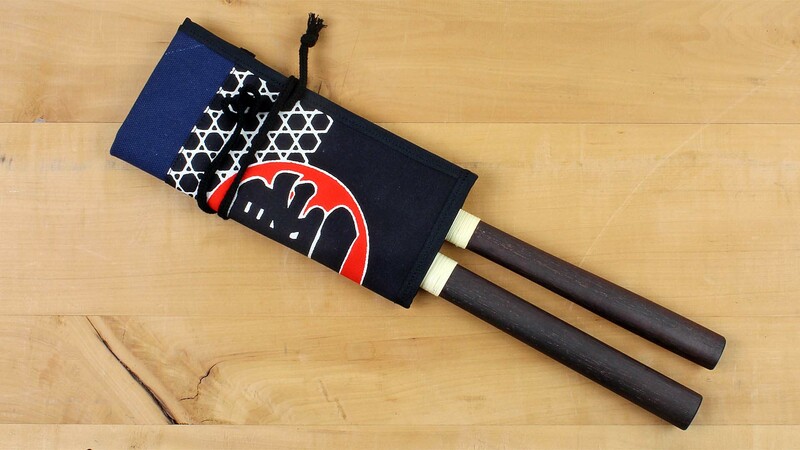 The Dozuki and the cross-cut side of the Ryoba can also be used for blockboard and chipboard. The hook-shaped saw blade end is uniquely suited for blind plunging cuts, eg, for cutouts in boards. The saw teeth are laser-hardened for a long tool life. To order replacement blades go to the Dozuki and Ryoba page. This saw set consists of a Ryoba Lifesaw with a 250 mm blade (313780) and a Dozuki "superfine" with a 240 mm blade for fine cuts across and with the grain (309325) plus an undyed canvas pouch for three saws (309858). This is also the ideal set for vocational training, because as a rule the two saws will be adequate for any required cut. The Dozuki and the cross-cut side of the Ryoba can also be used for blockboard and chipboard. The extraordinary clean cut of the superfine saw in the set will delight you. The tooth pitch of 1 mm and the small saw set - just 0.4 mm for a blade thickness of 0.3 mm - are two important performance-enhancing factors. If you are aiming for particularly neat and precise dovetail joints, then this is the saw for you. If you’re a beginner we recommend that you purchase a spare blade along with the saw. The fine saw teeth are naturally more susceptible to damage. Damaged teeth don’t indicate a material fault but simply that you veered off course with the saw. The Ryoba Lifesaw is a robust and rapid universal saw - ideal for deep cuts across and with the grain - for use in workshops and on building sites. The saw blade is fixed with a screw and can be easily dismantled with a coin as a screwdriver substitute. Dismantled the saw fits into a small tool bag and the Tooltainer! For very clean and fast cuts in softwood such as pine and spruce and European hardwood such as beech and oak. The teeth of both saws are laser-hardened for a long tool life. This saw set consists of a Dozuki "Superfine" with a 240 mm blade (309325), a Ryoba (309310), a Kataba (309300) and a canvas pouch (309858). 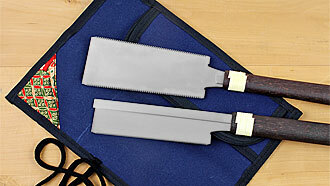 This is the ideal set to begin with, because all the customary cuts can be made with these saws. 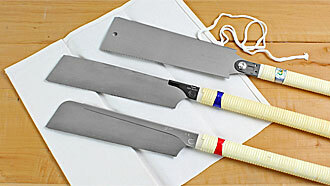 To order replacement blades go to the Dozuki, Ryoba and Kataba page. 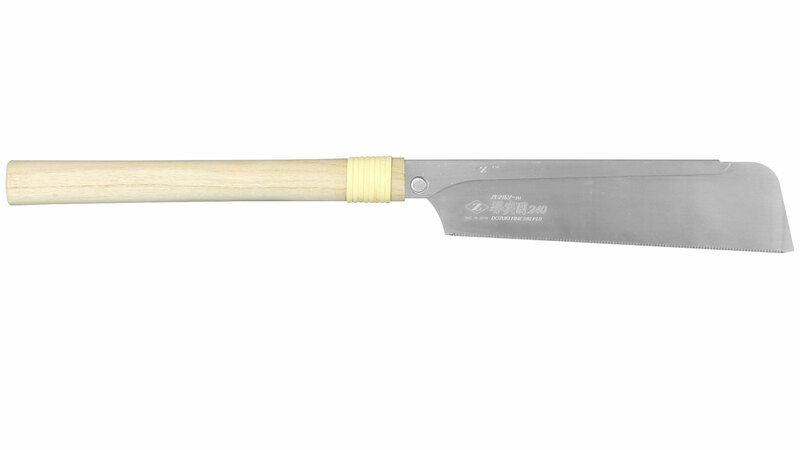 This saw set consists of a Dozuki "Superfine" with a 240 mm blade (309325), a Ryoba (313780), a Kataba Universal (313790) and a canvas pouch (309858). All saws are made by the noted manufacturer Z-Saw. The highly flexible saws are all capable of cutting with or across the grain. 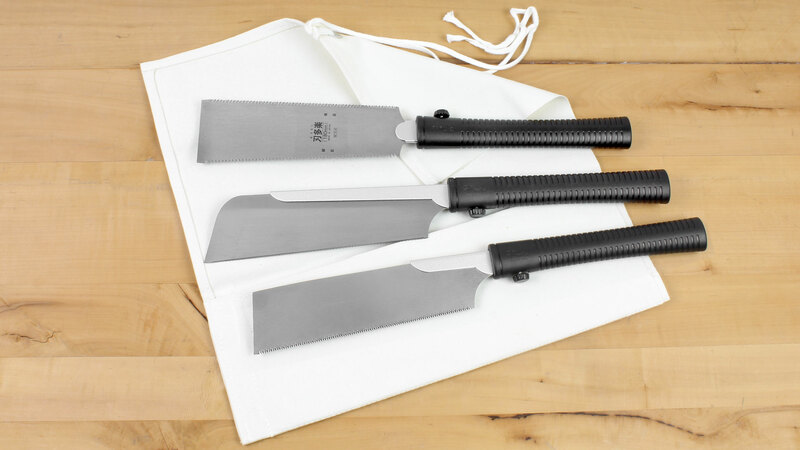 This saw set consists of a Ryoba with a 300 mm blade (309314), a Kariwaku with a 330 mm blade (309306), a folding saw with a 240 mm blade (316312) and a canvas pouch (309858). All saws are enhanced for use in a carpentry shop, where timber tends to have a slightly higher moisture content than in a joinery. The large teeth make for rapid cutting and do not clog up as quickly. 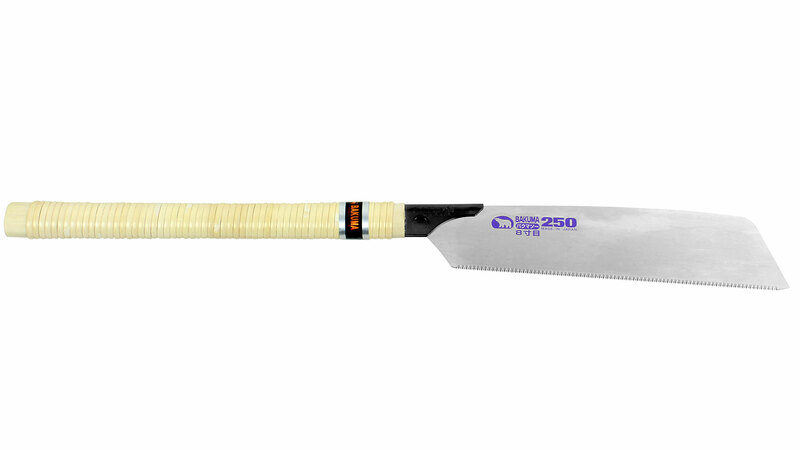 The blade of the Ryoba is 300 mm long and provided with teeth along both edges, one for longitudinal cuts, the other for cross-cuts. The Kariwaku with a 330 mm long blade is especially suited for cuts across the grain, being extremely fast and rugged. The folding saw will be your constant companion for smaller touch-up jobs and if you have to climb to a position where a larger saw would be a hindrance. 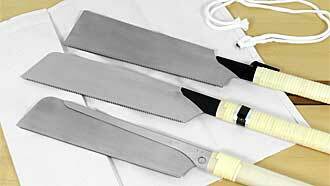 To order replacement blades go to the Ryoba, Kataba and Folding saw page. 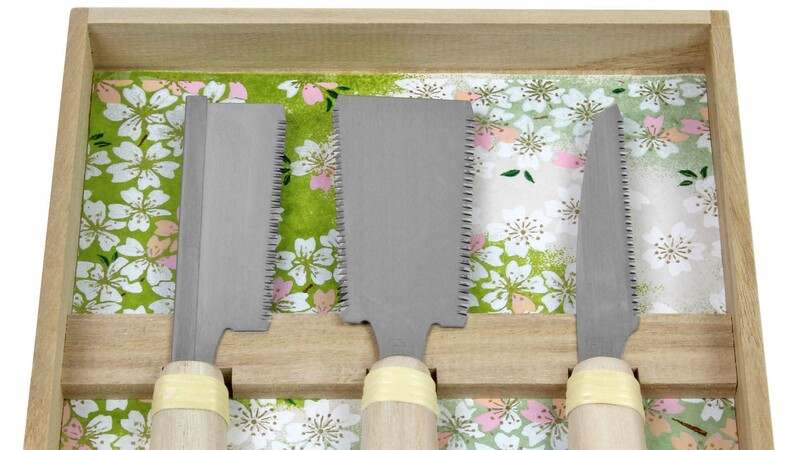 This set consists of a Dozuki "Duo" short for ripping and cross-cutting (312036), a short Ryoba for deep cross-cutting and ripping (312098) and an undyed canvas pouch (309858) with space for 3 saws. 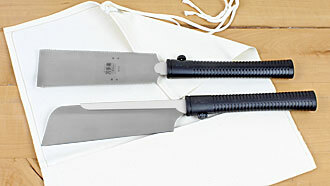 The blade lengths of the Dozuki and the Ryoba are 190 mm and 180 mm, respectively. This ideal set for building sites is also suitable for plywood and MDF. 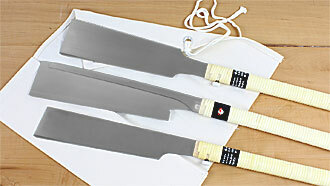 To order replacement blades go to the Small Japanese Saws page. 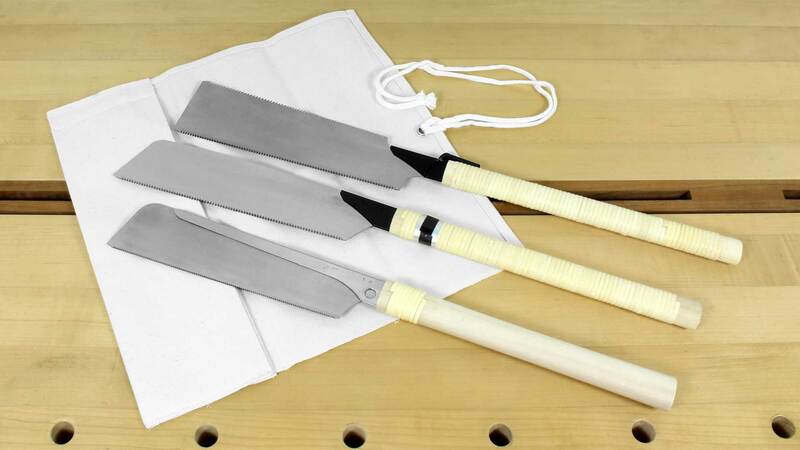 This set consists of a Dozuki "Duo" short for ripping and cross-cuts (312036), a short Ryoba for deep cross-cutting and ripping (312098), a short Kataba mainly for cross-cutting (312040), and an undyed canvas pouch (309858). 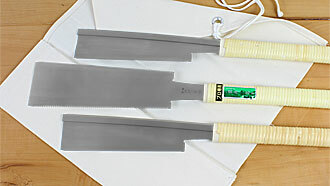 The blade lengths of the Dozuki and the Ryoba are 190 mm and 180 mm, respectively. This ideal set for building sites is also suitable for plywood and MDF. 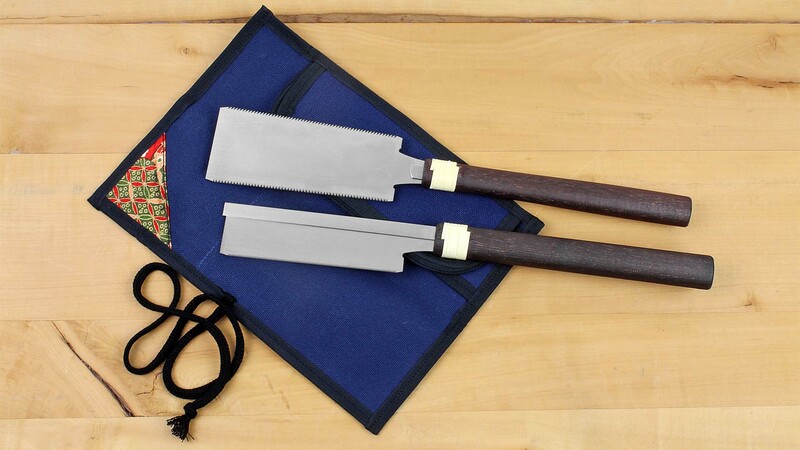 This set consists exclusively of a series of tempered saws made by Kijima. 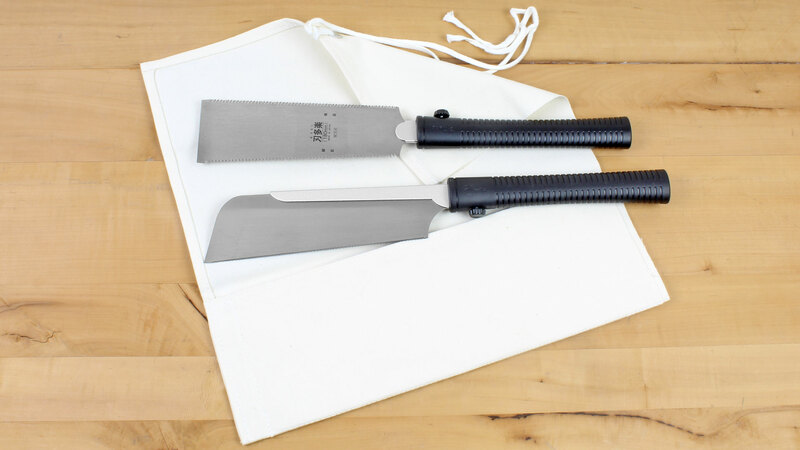 It includes: 1 double-edged Ryoba, 7-inch (210 mm) blade length (309457), a Dozuki backsaw, blade length 8 inch (240 mm) (309450), a single-edge Kataba (309465), and an undyed canvas pouch for 3 saws (309858). 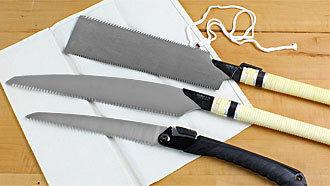 These are our best saws with interchangeable blades. 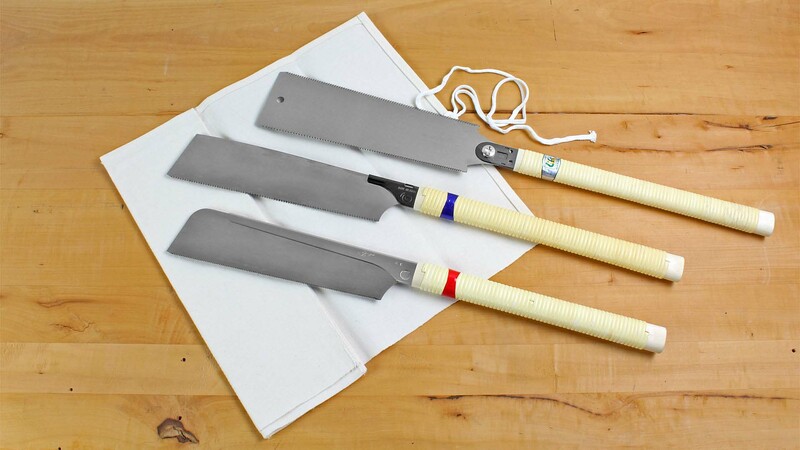 To order replacement blades go to the Kijima Saws page. 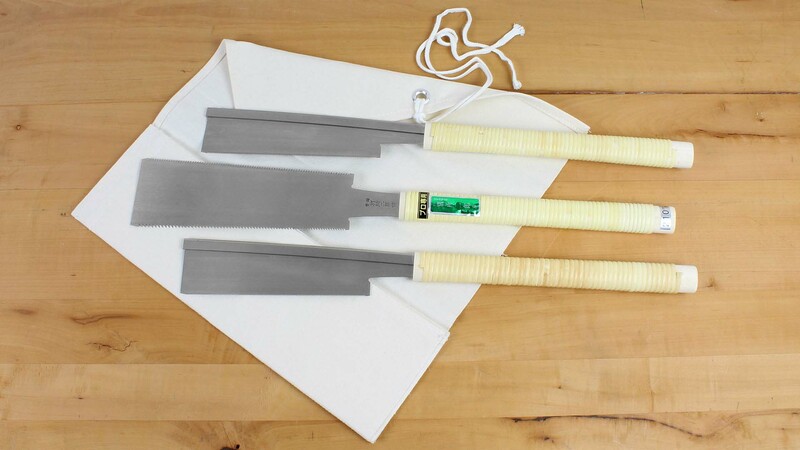 Set consists of a double-edged Ryoba, blade length 7 inch (210 mm) (312057), a Dozuki for cross-cutting, blade length 6 inch (180 mm) (312060), a Dozuki for ripping (312061) and an undyed canvas pouch for 3 saws (309858). 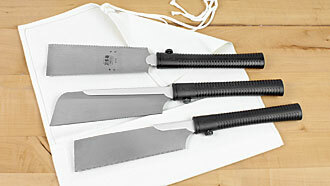 When it comes to refinement and quality of cut, these saws leave nothing to be desired! 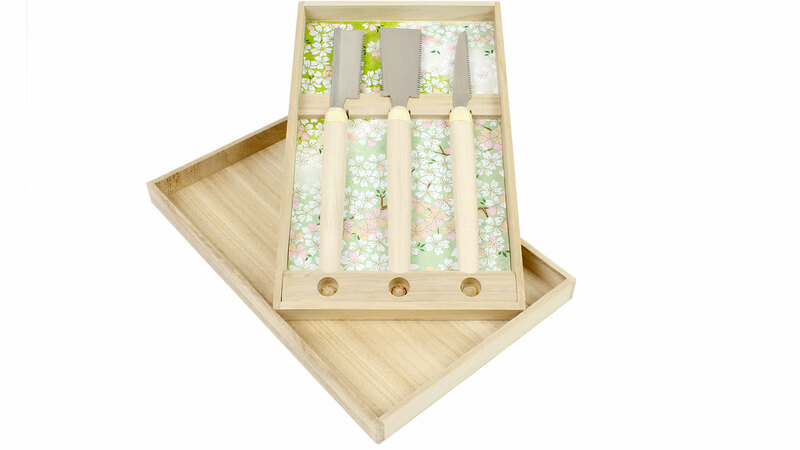 This set consists of a double-edged Ryoba, blade length 120 mm (5 inch) (312053), a Dozuki for cross-cutting and ripping, blade length 120 mm (5 inch) (312052) and a decorative canvas bag (312049). High quality saws for the professional user! Makes a great gift! 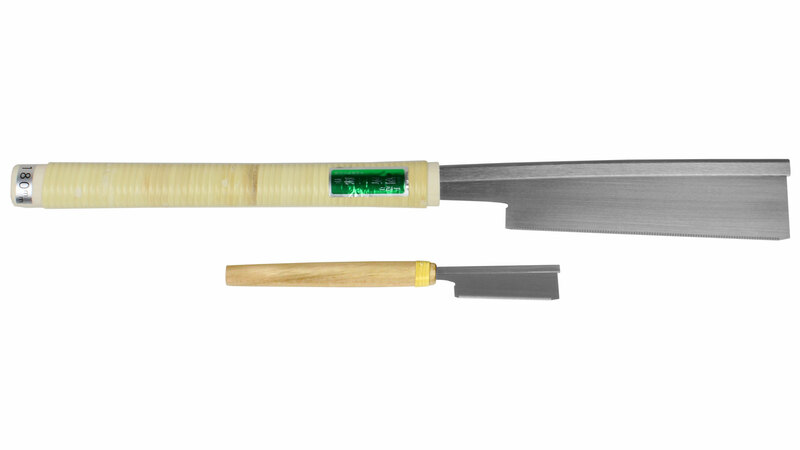 This saw set includes a Ryoba with teeth on both sides of the blade, a Dozuki, and a Kataba for cross-cutting. 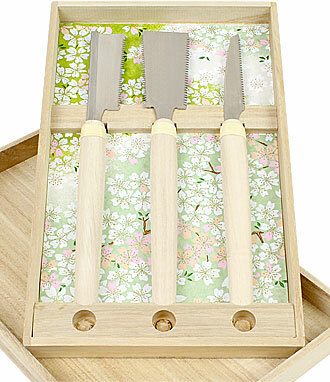 The saws come carefully packed in a finely crafted wooden box. The saw blades are about 75 mm (3 inches) long with 60 mm of teeth. 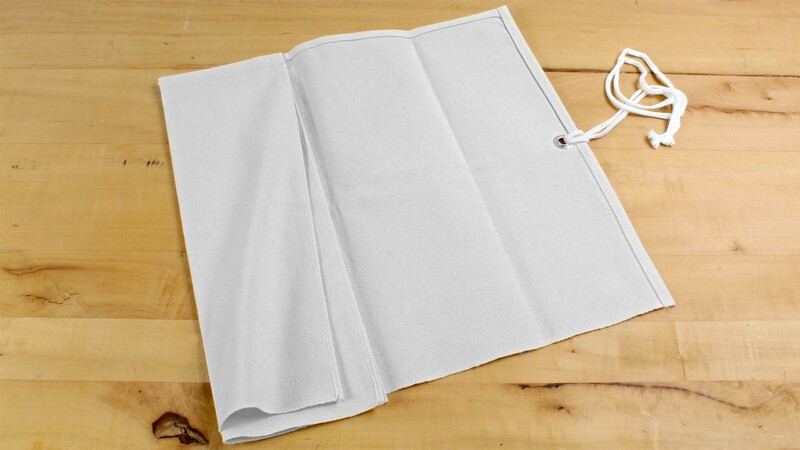 The handles are about 130 mm (5.2 inches) long, making a total length of about 215 mm (8.6 inches). The blade width on the Ryoba and the Kataba is 0.3 mm and on the dozuki 0.2 mm. The tooth pitch of cross-cutting blades is less than 1 mm (26 TPI) and the tooth pitch of ripping blades is about 1.8 mm (14 TPI). 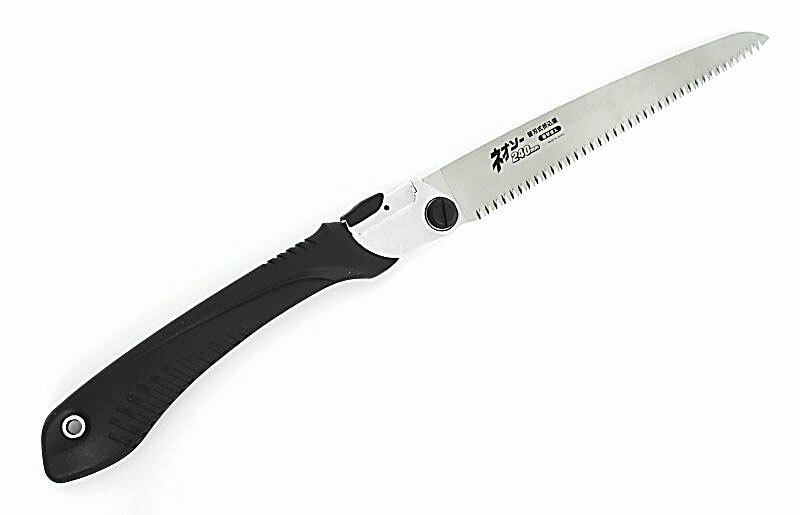 These saws are fully functional, like normal-sized saws, and made to the same high standard. They come from the sawsmith Hishika in Miki, where our traditional professional saws are produced (see photo and saw set above). Look at more photos, and a comparison photo with a saw of normal size. The saws are not sold separately.